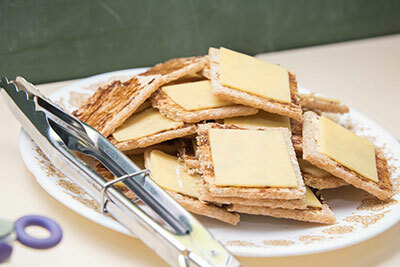 Dairy products are foods such as milk, cheese and yoghurt. These foods are a good source of calcium. Calcium helps your bones and teeth stay healthy and strong. In the first six months your baby will get all the calcium they need from breastmilk. This is why Ms Holland recommends waiting until your child is around 6 months of age before introducing solid foods like cow's milk and yoghurt. After 12 months, your baby can drink more cow's milk; however they should drink no more than 500mL in a day. “Too much cow's milk can lead to low levels of iron. It is important to make sure your child gets a balance of what they need” says Ms Holland. Other dairy products like cheese and yogurt can be introduced with other solids around 6 months of age. Ms Holland suggests introducing a variety of vegetables and meat first as your baby will still be getting the calcium they need from breastmilk. The amount of dairy your child needs depends on their age. Generally they should have between 2-3 serves of dairy per day. A serve of dairy is one cup of milk (250mL), a tub of yoghurt (200g) or 2 slices of cheese (40g). Dairy is an important part of a healthy diet and a healthy diet will help your child grow and develop. If you are worried about what or how much your child is eating speak to your local doctor or a childhood dietitian. 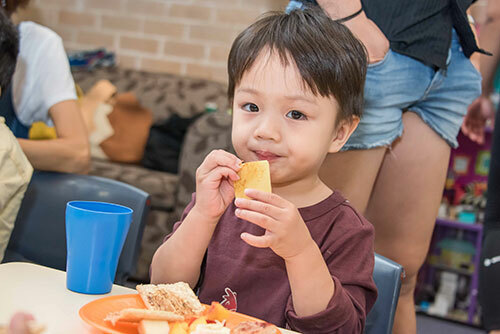 If you live in Sydney Local Health District contact the Child Health Information Link on 9562 5400, select option 2 and ask for a referral to a childhood dietitian. It is important to remember that the amount of calcium in a dairy product does not change that much between full fat and low fat products. Luckily there are lots of options for children who are lactose intolerant. Click here to find out more. If you think your child is lactose intolerant, it is best to see your doctor to confirm. There are lots of alternatives for children who are lactose intolerant. When it comes to milk, Ms Holland recommends soy as it has similar benefits to cow's milk. When choosing a soy milk make sure it has lots of calcium. “It should say 120mg or 100mL of calcium on the label” says Ms Holland. There are lots of other milk alternatives such as almond milk, oat milk and rice milk. If your child cannot have soy milk, or if they don't like it, then you can try one of these alternatives. Again, just make sure it has lots of calcium. These milks usually have less protein. If your child is eating enough meat and other protein foods then this won't be a problem. For information on protein foods, click here. Sometimes alternative milks have lots of sugar or sweetener. You can check this by reading the food label. If you don't know which is the best alternative for your child speak your local doctor or a childhood dietitian. If breastmilk is not an option, infant formula will provide your baby with the calcium they need.